Laurent Lamothe, Haiti's Prime Minister, flew to Nicaragua for the Eighth Petrocaribe Summit held in Managua this year. Accompanied by President of Foreign Affairs, Wenceslas Lambert, and Marie Auguste, Deputy Minister for Human Rights and Fight against Extreme Poverty, they came to negotiate with Venezuela on forming an economic zone. Eighteen countries constitute the Petrocaribe, a consortium of South Region nations. This year's summit was held on June 28th and 29th. President Nicolas Maduro of Venezuela chaired the discussion panel and addressed the proposal of government of Haiti (GOH) for a trade program between the two countries. With the creation of an economic zone, it will be possible to increase Haiti's oil usage from 14,000-20,000 barrels per diem to a more beneficial quota. 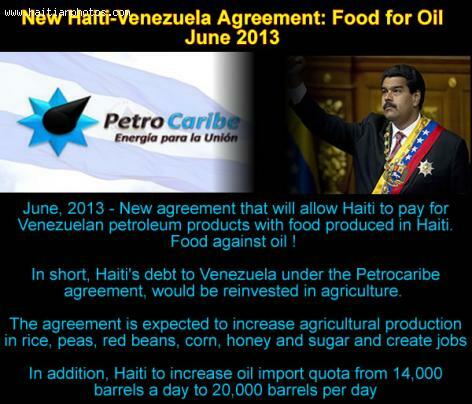 In addition to increased agriculture out-put, the oil procured from Venezuela will improve Haiti's labor market and exports. With exchange oil, Haiti hopes to produce and export staples such as rice, peas, red beans, corn, honey, and sugar grown on Venezuelan-subsidized farms. Lamothe spoke about the economic trade zone to be developed to the media. He said this exchange will help regenerate the ailing agriculture sector, provide more jobs, and lift Haiti out of chronic poverty. To be off the failed states index is an urgent goal of the GOH. He added Guyana and Nicaragua have an exchange program that has produced significant results in lowering the poverty level in that nation. Haitian President Michel Martelly was also in attendance at the summit. la plus belle femme du monde ne peut donner que ce qu'elle a. Haiti n'a jamais paye sa facture petroliere avec les recettes provenant de ses exportations de biens agricoles durant toute son histoire moderne, soit plus de 75 ans. Or, ce deficit s'est agrave ces temps derniers. Avant petrocaribe, la facture etait payee regulierement et le petrole achete au Venezuela, il faut le signaler, par une combinaison entre les recettes des transferts directs, les exportations et l'aide internationale. Si Petrocaribe deviant "un tracas economique", retournons aux anciennes formules. this is nice. build big hotels for the rich to see how poor the country is. so that they will invest.? how bout invest in housing for the poor and move them off the land that they are on and show the world that Haiti is moving forward with or without sightseers..
no co. in there right mind will ever invest long term in Haiti without 1st seeing something being done about the crime, housing,roads, laws not being upheld, flooding.